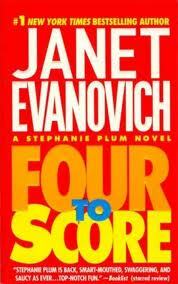 Mysteries never appealed to me until I started reading the Stephanie Plum series by Janet Evanovich about 6 months ago. I have only read the first four but I love them! I'm trying really hard not to buy a new book every time I finish one ... I patiently wait until I can get to a used book store and scarf up as many as I can find. I just finished "Four to Score" and it did not disappoint. With any series, I believe it's best to start off with the first book. Even though most later books will give a little background info, you just don't get the feel for the characters unless you go in order. (Totally my opinion though.) In "Four to Score", Stephanie is after a bail skipping waitress who is seeking revenge from the man who put her in jail. Stephanie gets help from a slew of characters; fellow bounty hunter Ranger, ex-prostitute Lula, Sweet Sally the cross-dresser, and of course Joe Morelli, who Stephanie just can't seem to stay away from. To top it all off, Stephanie has to deal with her arch-enemy who keeps getting in her way. I busted out laughing a few times, especially when Grandma Mazur comes into the picture. She is just too funny! So far, this series has been extremely entertaining, and I'm looking forward to reading "High Five". If you like light mystery reads, you should give Janet Evanovich a try. Do you get hooked on series'? Is there a good one that you have read lately? And I'm in awe that you can read more than one book at the same time. I get so involved with the one that I usually have to finish it right away! Fun Stuff ... Happy Pi Day!